After a long work week, the Shalon offers community, inspiration and nourishment - enabling each of us to step away from our daily responsibilities and focus on an issue larger than ourselves. As we enjoy incredible food and drinks, we are encouraged to open our hearts and our minds to what is happening around us. Each Shalon is led by moderators who encourage us to ask questions, share our thoughts and identify the ways we'd like to get involved. Each conversation is just a beginning; an opportunity to be educated, to open up to possibilities not yet considered and to commit to something that matters to each of us. For as long as I can remember, I have loved bringing people together. I am energized by hosting meals, club meetings, strategy sessions, movie marathons, slumber parties... you name it, I'm interested. 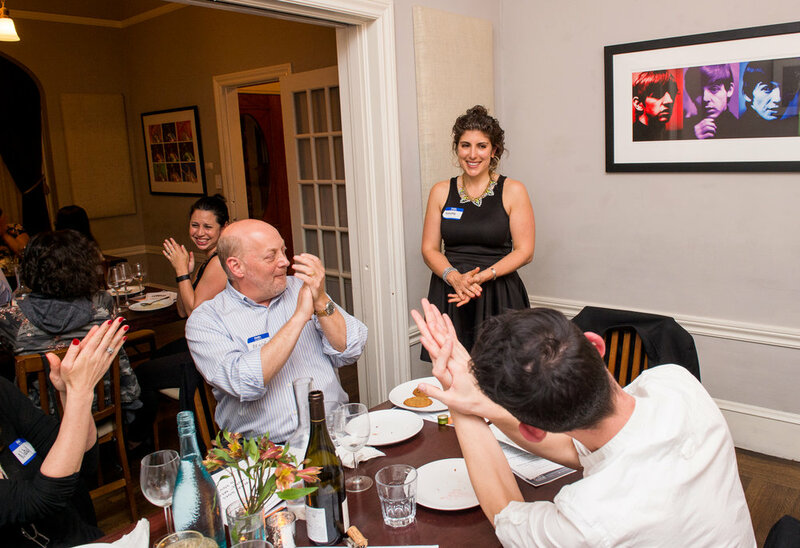 I started hosting Friday night dinners, based on my family's Shabbat dinners growing up, for my friends a couple years ago. These evenings were an excellent way to bring different people together, to unwind and to share our stories. As I listened to poeple connect, I realized that the dinners could be so much more. Each guest at the table had so much information and passion to share about topics that were important to them. Why couldn't I formalize a process to focus on topics that impacted my friends, neighbors and city at large and help people drive change where they felt it was most needed? There was nothing to stop me, and the first official Shalon was born in January 2017. The combination of a Salon environment for real discussion, idea sharing and mobilizing around issues that matter and Shabbat (the Sabbath) when we remove ourselves from daily minutia to connect with one another, focus on our families and communities, learning and enrichment. Every conversation I've had, with a new or old friend, has been respectful and insightful. Wanting to know more? Reach out. We believe that the best way to get to know someone is thru conversation. Whatever your desire is, we are to talk. Fill out the form below and let us know and we will respond within 48hrs.